Created more than 50 years ago, Michigan’s 56 intermediate school districts are an entrenched part of the K-12 public education landscape. But few people really understand what ISDs do, how they are funded and what value they provide taxpayers and students. ISD responsibilities vary and their statutory role is broadly defined. Nevertheless, there are some common functions that ISDs perform across the state. Most ISDs, for instance, provide back-office support for local school districts, deliver or finance special education services and operate alternative and career education programs. Many also facilitate shared services among districts, such as technological needs, transportation, professional development and more. ISDs are funded differently than local school districts and public charter schools. The primary difference is that ISDs do not receive the normal foundation allowance, the main per-pupil funding mechanism used to distribute revenues to school districts. Instead, ISDs are funded by a combination of local property taxes, a per-pupil special education foundation allowance, state categorical funds and federal grants. Reported ISD revenues totaled $2.77 billion in 2016. ISDs have five different types of local property taxes to draw from. To pay for general operations, all ISDs collect funds from a voter-approved “operating millage.” There are designated local millages for special and vocational education services too. The rates for each of these three millages are capped based on what their rates were in 1993, before Proposal A took effect. A small number of ISDs levy a “regional enhancement millage” of three mills or fewer, but it is actually revenue for each of the conventional school districts within an ISD’s boundaries and distributed on a per-student basis. The final type of local property tax ISDs can levy is for debt services — allowing them to finance building, remodeling and furnishing their facilities. Combined, these five local sources of taxes bring in nearly half of ISD revenues. Another significant source of ISD revenue — amounting to about 30 percent of all their revenues — comes from the state treasury. While some of the dollars are distributed within various state budget line items, several distinct pieces are set aside for the 56 regional educational agencies. First, the state supplements ISD revenue for special and vocational education in an effort to create more funding parity among ISDs. Using complex formulas, this money benefits ISDs that raise the least amount of revenue from their local property base. These “equalization” dollars guarantee that all ISDs will receive a minimum amount of revenue to fund these services — at least 75 percent of what they had received the previous year. These payments cost the state almost $50 million annually. A large chunk of state revenue for ISDs is a reimbursement for approved costs for special education services. This revenue is court-ordered: the Michigan Supreme Court ruled that the state needs to provide a certain portion of the funding for the mandates it creates for school districts to educate special needs students. ISDs collected more than $270 million for this purpose in 2016. The last piece of ISD funding is federal money, which makes up nearly one-fifth of ISD revenue. Some of this money is received by the state and then distributed to ISDs while other amounts are received directly by ISDs themselves. Federal money often comes in the form of grants for specific purposes, programs or services. Among them are funds designated to cover special education costs, to help homeless students or non-native English speakers, and to underwrite early childhood or community health programs. ISD funding growth has outstripped that of local school districts and public charter schools. Between 2006 and 2016, the number of students enrolled in ISD programs has not changed much, increasing by just 2.6 percent. Meanwhile, total ISD operational spending has increased over the same period by 39 percent. 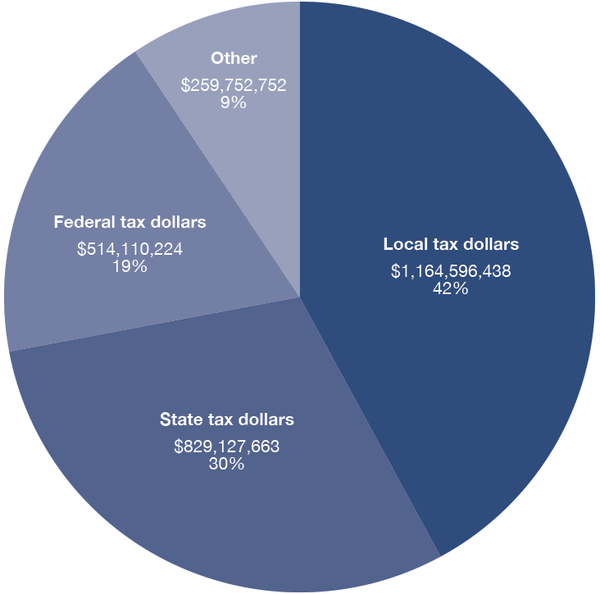 Today, nearly 10 percent of K-12 operating dollars are spent by ISDs. As demonstrated, ISD funding is complex, with revenue coming from a variety of different sources and targeted for a variety of different services. Although they are not often the first thing that pops into people’s head when they think of Michigan’s schools, ISDs consume a sizable chunk of taxpayers’ support for public education in Michigan.